Last night, Justin Verlander lasted one inning, gave up five runs, and left the game with “right shoulder soreness”. After the game, Verlander admitted that this had “been lingering for a little while”, which shouldn’t come as a huge surprise, given that Eno Sarris postulated that Verlander might be pitching through an injury a few weeks ago. And while average fastball velocity certainly isn’t the only way to tell if a pitcher is pitching through a health problem, the game by game chart from BrooksBaseball.com does make it seem like perhaps this became a more serious problem in mid-June. On June 21st against the Indians, Verlander threw 51 fastballs with an average velocity of 95.1 mph. On the 26th, facing the Astros, his average fastball was just 93.5 mph. Against the A’s on July 2nd, he averaged 92.4 mph. And then, finally, he bottomed out against the Dodgers on July 8th, sitting at just 92.1 mph. Over the course of four starts, he lost three miles per hour on his fastball. He got back into the 93 range over his last few starts, but is still well below where he was earlier in the year. And as Eno noted, his release point has been less consistent, and he’s throwing fewer pitches in the strike zone. Maybe the MRI will show that he just needs some rest and there’s no structural damage, but historically, these variables have done fairly well at identifying injured pitchers. 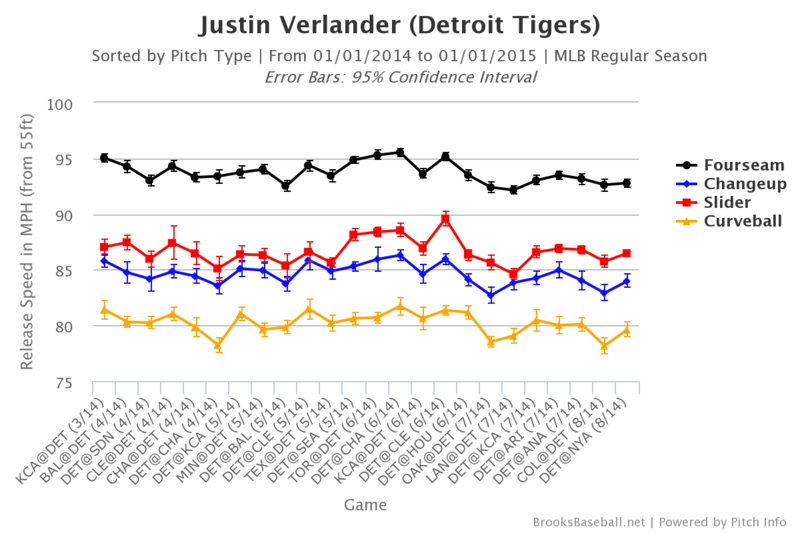 And so the Tigers should probably not plan on having the old Justin Verlander back any time soon. We hoped you liked reading On Justin Verlander’s Health by Dave Cameron! I’m so confused by the Verlander data. The Brooks baseball game logs just don’t line up with what I remember. He was topping off at 95 earlier in the season, not sitting there. His first inning FBs were upper 80s. Meanwhile the fangraphs PitchFX velocity charts call anything at 91 or below a change up, which used to work but hasn’t for a couple of seasons now. That said, the velocity has dropped off again since mid-June. That drop-off is definitely there.